For This Vineyard, It's Duck, Duck, Booze : Parallels You've heard about the running of the bulls — how about the running of the birds? 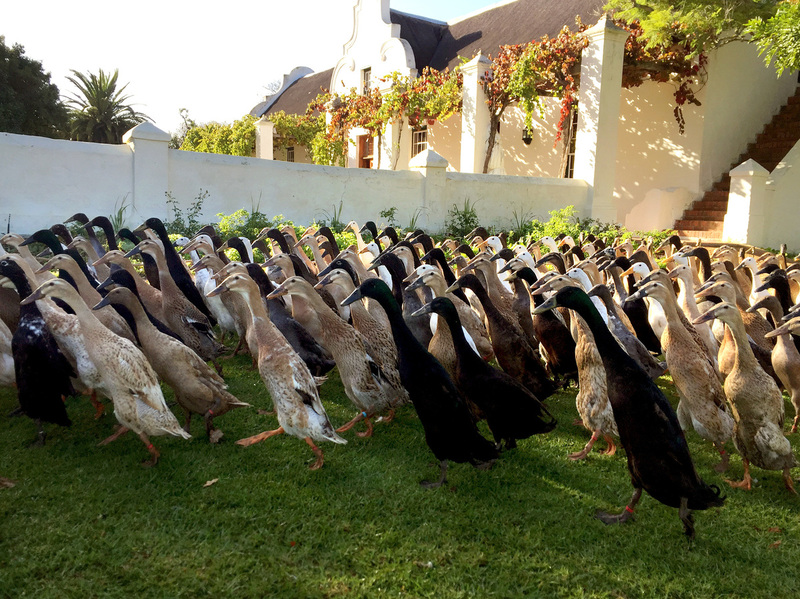 Each morning, hundreds of ducks are released to patrol a Cape Town vineyard. Indian runner ducks have been used in Asia for thousands of years to control pests. Now they're used in a South African vineyard to eat snails that damage the vines. On Vergenoegd Wine Estate in Stellenbosch, South Africa, about a thousand Indian runner ducks parade twice a day into a vineyard to rid it of pests. It's a remarkably orderly scene. Unlike your typical waddling duck, these ducks don't sway back and forth. They run quickly in a straight line. Every morning at 9:45 a.m., they emerge from a gate and zip around the gleaming white manor house – even sticking to a manicured gravel path. They run in formation. Their beaks all point in the same direction, their bodies all turn at the same time — like they've worked on the choreography beforehand. The previous owner of the wine estate, John Faure, is a bird lover and brought them over from Asia. They have been at the estate for at least 30 years. The history of the breed goes back much further. According to the Livestock Conservancy, runner ducks have been used in Asia for thousands of years to glean snails and insects from rice paddies. The Vergenoegd ducks have a similar job. They eat the snails and insects in the vineyard. Denzil Matthys, the duck caretaker at Vergenoegd, says the ducks help make the farm sustainable. "We try to keep a pesticide-free farm by using the ducks," he says. "They help us not to use poison on the farm." The runner ducks stand upright, giving them the ability to pluck snails from high up on the trunk. They're skinny enough to fit between the vines. "The Indian runner duck is the best worker in the vineyard," Matthys says. Marlize Jacobs, the farm manager and winemaker, says snails are a big problem at Vergeneogd because of the vineyard's proximity to the ocean. The culprit is a small, white dune snail. "After winter, the vineyards bud," she says. "Those buds are succulent bits of food and snails love to eat them. If we don't control them, they will absolutely destroy the vineyard." Enter the runner duck fleet. They patrol 140 acres of vineyard for about five hours a day, five days a week. Watching them spread out in the vineyard, it's difficult to imagine how the farmers round them up for the night. "Oh, getting them back is the easiest!" Jacobs says. Asian farmers used bamboo poles with cloth attached to one end to drive their flocks home from the rice paddies. At Vergenoegd, three men wave flags to direct the ducks back to their pens. The ducks resume formation and take the gravel path home. Jacobs says that even though the ducks forage all day, they get hungry and are eager to go back for their evening meal of corn — a fine accompaniment to escargot.